Some of our clients after an online search for Apostille Certification Services find this confusing because Canada has not signed the Hague Apostille Agreement so how are they going to get an Apostille. Not to worry we have the answer, Canada follows the original process to validate documents internationally. That means if you have your documents authenticated and legalized here in Canada they will be accepted as the equivalent to an Apostille in Spain. This process has had changes, including new security features added for protection, that saves more time from the process. Those who have used the process to validate documents in the past may remember Canadian documents being used in Spain for university, work or immigration involved a three step process that included final registration in country. As many of our clients were not yet in Spain this extra step added time and expense in an already complicated process. All this was solved in June 2013 with the introduction of a new legalisation procedure whereby a registration sticker is affixed to the document and the feedback has been positive. Over the years we have also had clients who have been asked to do an additional step and have their Degree or educational document signed by the Ministry of Education here in Canada. It’s important to note that this is not possible for someone in Canada to do and is only applicable to people from other countries. Although the new process eliminates the final step of registration in Spain the steps of authentication and legalization here in Canada are still required for a document to be the equivalent of an Apostille. Let’s start with what is required for the first step of authentication of documents at Global Affairs Canada here in Ottawa. Global Affairs Canada can authenticate your original degree, diploma or transcripts issued by any institution recognized by the Provincial Ministry of Education. In addition to an original issued document they are also able to authenticate certified copies made by the institution. To help ensure your document is ready for authentication with Global Affairs Canada feel free to use our Request A Quote page our consultation guarantees authentication. The current processing time for Document Authentication at Global Affairs Canada, if dealing with them by mail or courier, is 25 business days. Not to worry we have a quicker solution as we attend in person on your behalf, see our 1, 3 or 10 day authentication services options. After we have completed the authentication of your document at Global Affairs Canada we update you via email telling you we are getting ready for the next step of document legalization at either the Embassy or Consulate. Where the second step of legalization takes place is determined on many factors. With over two decades assisting clients with document legalization for Spain we have worked closely with the Embassy of Spain in Ottawa, Consulate of Spain in Toronto and Consulate of Spain in Montreal to ensure all is processed correctly and quickly. Depending on where your document has been issued or where you are located will determined the correct consulate for processing. If you are not currently in Canada not a problem we can assist from wherever you may be. After we have completed legalizing your document it will be accepted in Spain as valid and the equivalent of an Apostille our legalization service guarantees it. If you need help returning the document to you or somewhere else in the world by courier feel free to ask. It’s not a problem our shipping made easy solutions will help get it to where you need it to go see more about your options. 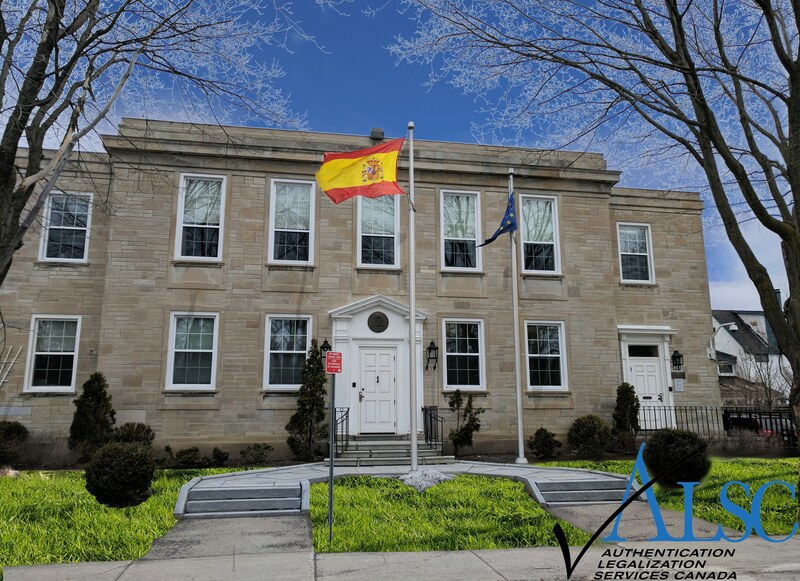 If you need Authentication and Legalization or information about Apostille in Spain we can help contact Canada’s experts at Authentication Legalization Services Canada.